The holiday is right around the corner and it’s time to prepare some holiday gifts for the kids’ school teachers. In the past, we always teamed with other parents to give the teacher one gift card with contributions from everybody in the group. This year, things are little different because we are relatively new and so far we were not contacted by any parent regarding gifts for teachers. So we need to do it alone. There are holiday promotions to save on purchase and shopping. The promotion we used is Get $5 Off on 2 or More Gift Cards with promotion code AFL5. In addition, AMEX is also offering free standard shipping ($5.95 value with promo code AFL420) during the holiday promotion period which runs from now to December 31, 2009. However, since we need to get the cards before this Friday, the standard shipping via USPS probably isn’t fast enough. Fortunately, AMEX has a complementary upgrade to express 2nd shipping for $5.95, the same as the cost of standard shipping. We bought the gift cards in batches of 2 cards to save $5 on each order and used the complementary 2nd shipping at a total cost of 95 cents (each card also has a $3.95 purchase fee). Not too bad a deal. It could be even better if we purchase cards with larger value. Update: New fee-free code EMNOVCM1 updated on December 3, 2010. This is not a bad deal at all, though you are right that it could be even better if the cards with purchased with larger value. 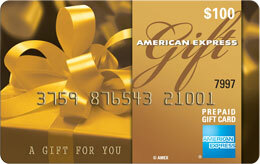 Amex gift card, in my opinion, is better than store specific gift cards.